Just few days back we covered Returnil System Safe which provides a Sandbox kind of protection to your system including anti-virus capabilities. Today we will talk about Sandboxie which lets you install and run programs in a virtual sandbox environment by isolating them from the real computer and hence preventing them from making permanent changes to other programs and data in your computer. Installation of the application is quite simple without any complicated configuration needed. When you run it for first time, it will detect applications like your Antivirus solution, Acrobat reader, Browser & many other applications, on your system and apply the compatibility settings for those applications to Sandboxie on its own. The user interface is too simple and this simplicity may confuse many users on how to use it. So in one way, this too simple interface can be bad for many users. 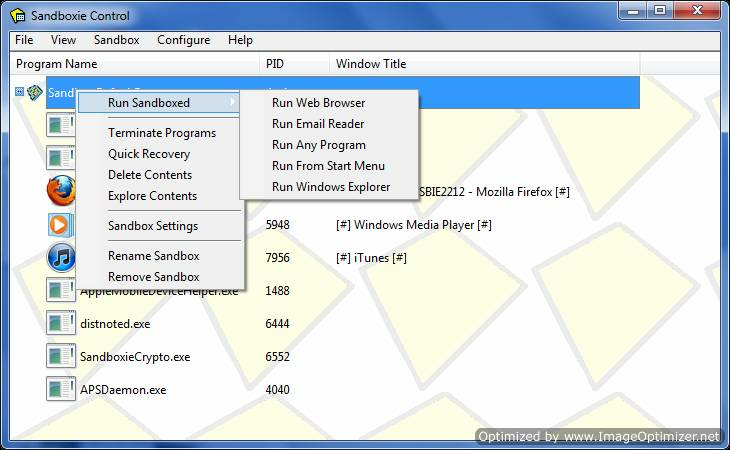 Even though it creates a shortcut for “Sandboxed Web Browser” in sandbox on your desktop, you need to use the program interface to run any other application under sandbox. You need to just right-click on ” Default Sandbox” and then you will find options for running different applications including web browser, Windows explorer or any other applications along with other options like settings, recovery option, or exploring it plus few more. Every application that runs inside sandbox environment is labeled as [#]———–[#] even inside the application and as the title of the running application. Also each sandboxed application is shown wrapped in a yellow rectangular box around it making it easy for you to distinguish them from normal applications. Apart from applications, you can even use this application for sandboxing files and folders on your system. You can run any application inside it by browsing for the application file and running it. If by default that application is not being added as compatible with Sandboxie, you can add them from the options window. You can add almost any application using this and the application will then run fine if it is not added or detected during the Sandboxie install. As you can see from the screenshot below, it has a big list of applications separated by categories. Thanks to tzuk , we are giving away 7 License keys of Sandboxie to readers of Avinashtech. Just follow the simple rules below to enter in this draw. Thanks Avinash and Tzuk for the giveaway! wow. count me in for this excellent product. Sandboxie-it helps to do Secure Web Browsing,protects Privacy & also allows to run any windows application in an isolated environment to protect one’s pc from virus attacks,would recommend it to every windows pc user.these are the most essential reasons to get a license for this application.thanks. Major awesomeness! !Â Sandboxie Rox, especially with used in conjunction with Buster Sandbox Analyzer ==> install & run a program within Sandboxie and BSA will report what it did, changes in system & most importantly & uniquely what changes in registry were made. Hey, another great giveaway! Thank you! Please count me in! Cool software giveaway, highly appreciated. Count me in please. Great software. Sandboxie is the ideal program to protect my computer. Especially against viruses. I need this soft a lot. Been using the freeware version. Hope to win a licensed copy to have the capability of creating multiple sandboxes. Please count me in Dear Avi. I want to use SandBoxie to secure my operating system from “the outsiders”. Too many unidentified files in the NET. That’s why I need this super tool to protect me too. Always downloading and trying new programs so Sandboxie would be a great software program to have. Please include me in this giveaway. Please count me in for this one too. awesome application. sandboxie provide great help of secure web browsing. maintain privacy especially history and cookies and email related risk. the best is Sanboxie provide sandbox for installing application/software on PC. it is very helpful when your antivirus tell that the file unproven as in case of Norton. I would love to get this license because, secure my system as always. SBIE is the best security software imho.. better than having AV.. count me in..
Sandboxing is a really a great application. It pretty much does what is says. Mr. Tzur with his coding skill did a masterpiece software. It was coded in a powerful programming language (C++). The user interface itâ€™s clean, and pretty much straight forward to understand and use. Sandboxie is a beast, and no other software does sandboxing better then this amazing program. I love that now itâ€™s now compatible with 64-bit operating systems, so now thereâ€™s nothing need to worry about. Itâ€™s multilingual so other people can understand it as well from all around the world. Downloaded the trial version a year ago and used it, but I had to uninstall it with tears in my eyes. After 30 days you get a nice little pop-up that offers the full version for a small fee. Tho not many people can afford it, and that was the reason that I had to uninstall it. I would love to have a license key, tho Iâ€™m pretty sure that my chances are pretty much low, but oh well. Count me in! A very usefulÂ application with a lower overhead than VMware to enable trialing of potentially useful but potentially hazardous new applications without risking your working PC setup. I often install many programs in my computer… it will be nice to have a sandbox for some of them which I consider unsecure and untrusted. Please count me in the drawing/ Thanks! I think this is a great software to use. Hope to win this one. I would love to try using this one.. Thanks for the chance…. Hi, Sandboxie is awesome, have used this excellent software in the past to test different apps in a sandboxed environment. I would like to win a license. Thanks for sandbox this is really great. Sandboxie is the best sandbox application in my humble opinion, and it is far ahead most of its major competitor in comparison of performance andÂ usability, so yeah it will be awesome if I could grab one for myself here to help me surfing in a safer environment. Thank for this giveaway and please do count me in! Highly appreciated for this kind offer. This excellent appliacation I use for many years as an unregistered version. Sandboxie is so small and very powerful in protecting the system. I would like to use the full, registered version of this program. I hope to get a license.Â Thanks for the giveaway. Good luck to all. I use free version for sandboxing browser and some suspicious programs. Sandboxie is one of my favorite programs wich I using for years. Thanks for this great giveaway. Thank for this great software. Sandboxie would really help me to protect my system whenever I wanted to try a new stuff in my PC which could be a possibility of inflicting a damage to my system and this is when Sandboxie could be come in handy for me! Running in virtual mode mean that I will be ensure of safety and able to undo the setting whenever thing goes wrong. Thank for this again and please do count me in! I wish to participate in the contest. Sandboxie is great for me because I frequently test out programs and don’t want to my OS to be affected by any changes. Thanks. Sandboxie ( free version ) I have been using for years. For isolation browser to launch and testing of small applications. I would be nice if I got a license and could use all the possibilities that this offers a great program. Cool giveaway this is one of the must have security software to enhance our system protection! Is is essential especially for a guy like me who constantly download and run lots of stuffs in my system which in case if there are any problem with the file, and this is where Sandboxie would come in help, allowing us to run on virtual isolation mode. This is a very good offer I would like to be included on the giveaway list. Thank you for this giveaway and wish all the best to you guy here. Sandboxie is a great software for keeping us safe while browsing and doing our activities in our system. It offer an extra layer of protection where most antivirus and equivalent security suite could not provide, the safe virtual mode. I am currently using BufferZone Pro as a free alternative to this, but I would love to have Sandboxie becasue BufferZone Pro that I am using are keep on crashing though I am not sure where the problem lies, it could probably due to the incompability of my 64-Bit system that I am using. Sandboxie also hell lots lighter and use lesser of my system resources too which is great. Please do count me in! Love to have this one for for my laptop. I test a lot of new software every day…some times with undesiredÂ results. This would keep my A** safe. lol The system I have been using is leaving me with a “open” feeling when testing software. Is it working is a question I would never have to ask with Sandboxie. Great review and giveaway, please count me in for this. Thank for this giveaway please do count me in I would like to use it to run on my system in virtual mode. This is a real awesome software. Please count and let me in this contest. Thank you. Since i haven’t won’t anything from this year’s ABC, so i am participating in this giveaway. Sorry i don’t have any other reason to participate :D. Anyway please count me, thank you. Great review Avi Â as I mentions earlier i do install lot of 3d app and few of them are warez ( because i can’t afford the m, as the price is quite high ) so I may have more chance to get infected even i i don’t use crack or keygen, sometimes few of trials are compiled with viruses , therefore its safe to use them in aÂ virtualÂ environmentÂ by using sandboxie . since i am loyal user of sandboxie for years and i have found it precious i would like to have a pro license instead of free that i am using. I wish to participate in the contest. please give me a license as it will protect my system. very good to have. your system through the net. Hi, thanks for this nice giveaway,please include me. I like Sandboxie to keep my PC malware free and always clean. Thank you (and Tzuk) for such a great giveaway. Please count me in. I share a computer, so the ability to force programs to run sandboxed, which is only available in theÂ licensed version of Sandboxie, would really help me out. Sandboxie is an excellent security programs. I use this programs for testing many applications. Thanks for the giveaway. I need it to protect my computer. I’m using and I am very pleased this program. License to an end and I would like to win a new one. Best site! Good giveaway! Good program! I have always used the free version, and would love the extra flexibility of the full version, particularly the extra automatic sandboxing capabilities. Firefox is my default browser, and the free version can automatically sandbox it, but it is Internet Explorer that I would actually like to would run sandboxed. As it is not my default browser, I would need the full version to do this. So please count me in, thank-you! Have used the paid version for a year and it has expired last November 2011. A lot has been said and some security applications made their own “sandbox” application but REALLY nothing comes close to Sandboxie still. SBIE is by far the best light virtualization application out in the market today and it has a growing follower number now. I like the way it helps you test software in a sandbox. You can do a test install in a sandbox (all internet blocked). You can also test and scan suspicious files inside the sandbox and it won’t escape the sandbox as it will contain it (well, provided you do not restore it to the pc host –tick “automatically delete contents of sandbox”. All in all a very very worthy complement to any pc. Too bad I got no license anymore and I’m stuck with the free version again. Very limute as you cannot force folders/programs etc.Â Please count me in for the giveaway 🙂 Really, REALLY, REALLY NEED ONE PLEASE 🙂 And oh, congratulations! OH GREAT GIVEAWAY! Just the app I need !!!! Kindly count me in. My license has already expired and now I am using the free version. Have tried to use Bufferzone Pro but ran into problems with my resident firewall. Sandboxie has no conflicts with any software and is very effective especially protecting your browsing habits. Forced Programs or Forced Folders options is superb so you can save or drop any files that you think is suspicious and configure that sandbox to not allow any connection out and limit access control. Sandboxie stops kernel mode drivers from loading into the operating system, and stops the loading of application (Known as Win32) hooks into other programs. This protection is a key in protecting your operating system. I have a free trial for me to try this Sandboxie. I want one. Thank you! I’d like to win this program, because I can safely open all websites, as well as to test their programs without instillation permanently. Just two clicks, and everything I have removed.Count me in. I’m dreaming about this app. Really would like to win a license. The greatest security application,sandboxie is a gem,even with default settings. this an excellent software i used it in the past. reliable, safe &secure. great opportunity to win a license so count me in. thanks. sandboxieÂ is an excellent software. The greatest security application. The result of one man’s vision and technical ability to challenge the paradigm of traditional heavy-handed tactics in the fight against malware [virus definitions, heuristics, behavior blockers] and utilize smart and original approach for delivering a complete peace of mind. Nimble, unassuming and so unbelievably effective at the same time. Thank you for the opportunity and good luck to all participating! If you know how to set it up properly.. it is leak proof and the best protection you can have.You need to to read up on how to set it up if you want to use it properly.I use the free version on all my computers and nothing has gone past it in my three years of using sandboxie.Thanks for a nice giveaway. sandboxie is a great software. i like to try softwares in sandboxed version. Count me in. Thanks. i like to try new apps..
so i very need this software…. Great contest! I use Sandboxie mainly every day when I test the newest malware on my PC. Please count me in. That’s a really fine giveaway, tank you ! I’ve been using Sandboxie (free version) for a few months now and must say that it certainly proves efficient in safer web browsing. I would love to be able to use Sandboxie’s full potential, so please count me in ! Its a great software and must have for every pc,so I need this key badly. Thanks for the opportunity, please count me in. I would like to win this Pro version, since I using free and I love it. ThanksÂ for this great Giveaway. Because it’s the almost perfect security program and safe environment to play with. Thanks for this great giveaway. Thats realy the best virtual sandbox. Could use this, looks nice and easy. Thanks for this very useful giveaway. I often install new software, so Sandboxie is a good help in order to avoid security problems and also to have my computer free of the ones I don`t like. Sandboxie is an ideal application for testing software. Furthermore it enhances system security through virtualization. Thanks for the review and this giveaway. Soundboxie is a great software. I’ve tried the free version and it is very useful, so I like to win a license. Thanks Avi for the giveaway. Feel safe when browsing if using browser sanboxed. this really useful software and mush have for me and all users. sandboxie never fail for me, always does great job. thanks for review and giveaway avinash. sandboxie is the best for online and PC security, Simple to understand and use.Â No need to spend your time on what to block on web browser. Provide sandboxed for email threat security. A program everyone love to have on its desk. Bardzo chciaÅ‚bym wygraÄ‡ ten program , poniewaÅ¼ jest lekki, a ja mam starego komputera programu antywirusowego , dla ktÃ³rych klasyczny jest zbyt ciÄ™Å¼ki. Z Sandboxie i mÄ…dry procedury tak mogÄ™ przenieÅ›Ä‡ siÄ™ jakbym miaÅ‚ Å›redniej klasy komputer , ktÃ³ry znacznie uÅ‚atwia codziennÄ… pracÄ™ . DziÄ™ki chÅ‚opaki za wielki konkurs i Å¼yczÄ™ wszystkim powodzenia . I would love to win this program because it is light, and I have an old computer, the antivirus program, for which the classic is too heavy. With Sandboxie and wise procedure so I can move like I had a mid-range computer, which greatly facilitates the daily work. Thanks guys for the great contest and I wish all the success. First, thank you Avinash for this giveaway. I would like to win one SandboxIE license since I free version of SandboxIE from long time I think this is amazing application. SandboxIE offers outstanding level of protection I really would like to use paid version because of freeware limitations. Thank you once again Avinash! Thanks Avinash and Tzuk for the Sandboxie paid version license giveaway.I would love to use the license for automatic sandboxing of different browsers and creating more than one sandbox at the same time which are available in licensed version only. Nothing can be compared to Sandboxie’s protection capability.Use Sandboxie Â to feel safe and secure rather than worrying about viruses and antiviruses. start/run as well as restricted internet access to some programs. Great software, please count me in, thanks. Great software, Count me in for sure! I try lots of software before I purchase it. This program is a great way to save on registry cleaningÂ and such. I’d like to win a license of this amazingÂ application because, as a heavy downloader, I’d like to set my mind at rest whenever I want to test an unknownÂ software or gameÂ within my machine. AndÂ SANDBOXIE is one of the best virtualizationÂ securityÂ appsÂ ever released so far, thanks to its clever idea toÂ create a sandbox-like shieldÂ capable ofÂ totally isolatingÂ users’ browser and OSÂ from any kind of online threat they may run intoÂ while surfing the web. This means that, if I had SANDBOXIE installed inÂ my machine,Â I could visit any website,Â download any app or game,Â use instant messengers or evenÂ open suspicious email attachment or links in a totally isolatedÂ environmentÂ ofÂ myÂ HD, leaving the registry of my system completelyÂ free from malware. Please count me in your contest. This is a nice software to have. Others considered it as a must-have. Hope to win one of the licenses…. Please count me in. This is a nice software…. Please count me in this great giveaway. Need sandboxie to try out all these GOTD freebees! Thanks! sandboxie is good for testing software for me. count me in. thanks. Great software!!! Please count me in. Really fantastic! I have the free version, but I would like to use the full features of Sandboxie, so please count me in ! I desperately need Sandboxie license to enjoy the full benefits. I want to run very many programs I check and use in a very very safe environment. I am using the free version but I find it limited as I cannot try some applications or use the force programs. There are limitations that are more needed for persons like me for testing software or checking out files prior migration to the host computer. I tried Bufferzone before but went back to Sandboxie free as it was conflicting with Online Armor free. Count me in for this giveaway please. Thank you for hosting a giveaway like this. When will be the draw date…? i want this software key…….